Law for Life provides multimedia information and education that explains how to manage legal situations in a straight-forward way. They run the award-winning Advicenow website providing a hand-picked and checked information service that draws together the best up-to-date information about the law and rights available on the internet. Has your landlord or their agent sent you an eviction notice telling you to leave your home? If this happens to you and you rent from a private landlord and the property you rent is somewhere in England, then this guide is for you. 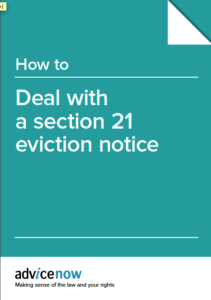 This guide: • explains what the notice really means, • explains when and why you may be able to challenge the notice and your landlord’s claim for a possession order, and • helps you work out your options and decide what to do next. First off – you may be feeling stressed or anxious, but try not to panic. Perhaps a friend, neighbour or family member can sit and read this guide with you. You may want to read it through more than once as you think about your options and decide what to do. If you rent a home in England from a private landlord and you need repairs doing, then this guide is for you. If you are living in something called ‘temporary accommodation’ you may think this guide doesn’t apply to you. But your temporary accommodation is probably rented from a private landlord. If so, you are a private tenant and this guide is also for you. 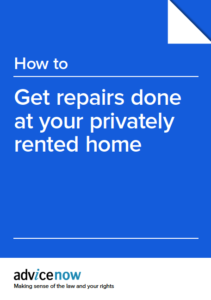 This guide explains: • who is responsible for repairing your home, • what you can do to get repairs done, and • what you can do if your landlord fails to repair something they are responsible for. It also helps you work out your options and decide what to do next. By law, landlords must protect deposits on assured shorthold tenancies in a government approved scheme. There are three schemes which protect tenancy deposits. If your deposit is not protected by the Tenancy Deposit Scheme, you can search the other schemes on the Shelter website. If you think your deposit is being withheld unfairly you can raise a dispute through the scheme. Is your letting agent a member of a professional or regulatory body? The SAFE Agent mark can be displayed by letting agents who protect tenant and landlord money through client money protection schemes (these may include the bodies listed above). Check if your agent is SAFE. There are accreditation schemes for landlords across the country. Find out about the schemes in your area.